Candle therapy can be used to unite the powers of mind, body, and spirit. Lilian Verner-Bonds shares in her book, The Complete Book of Color Healing, lighting a colored candle releases energy into the atmosphere. The color vibration is absorbed into the auric field and transmitted into the physical body. It is an interesting fact that the colors of our seven major chakras are also the rainbow colors. 1. 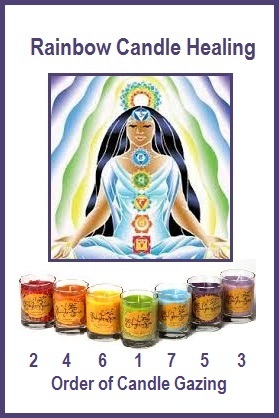 Place a candle for each of the seven chakra colors in a semi-circle in front of you starting from left to right (red, orange, yellow, green, light blue, indigo, & purple). The candles can be placed on the floor or on a table. 2. Sit quietly for a few moments in order to prepare yourself to receive. 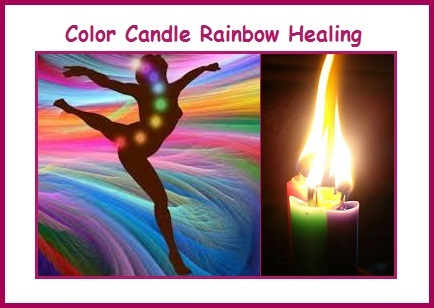 Light the candles, starting with red (Root Chakra) and ending with purple (Crown Chakra). 3. Beginning with the central green candle (Heart Chakra), gaze upon each flame for one minute at a time. Then move to the red candle at the left followed by the purple candle on the right. Continue by going to the orange then to the indigo. Complete the process by going to the yellow and finishing with the light blue. This will take seven minutes. (See illustration for gazing order). 4. While the rainbow candles remain burning, embrace all the colors. Accept the guidance from your higher-self as to which colors need revisiting. Continue for another ten minutes, finishing with the green candle (Heart Chakra) to balance your system. 5. Extinguish the candles in order starting with the red ending with purple (It is recommended to use candle snuffer or home-made tin foil cone). In candle healing it is suggested not to use your breath to blow out healing candles. 6. Sit quietly for three minutes with your eyes closed, to complete healing. Following yesterday’s color acupressure technique for asthma, lets continue today working on bronchitis and chest colds with color acupressure. 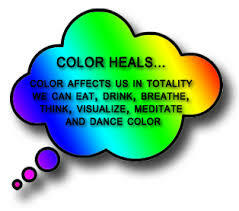 This technique and many others can be found in Lilian Verner-Bonds Book, The Complete Book of Color Healing. 1. 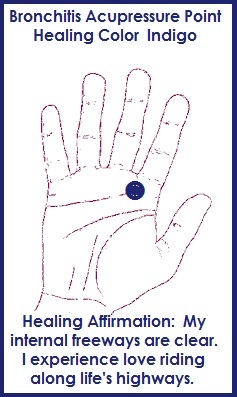 Locate color pressure point on hands and start gentle pressure. It doesn’t make any difference which hand is treated first. 2. Close your eyes and visualize you are running Indigo color into the pressure point. 3. Repeat the color counseling affirmation (at the bottom of illustration). 4. Continue treatment for five minutes at a time. More serious conditions may require attention three times a day until relief is attained. 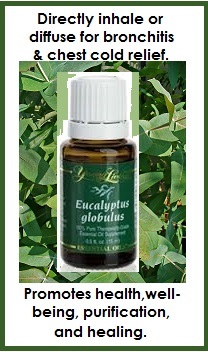 Following are the benefits for including Eucalyptus Globulus Essential Oil to your color acupressure technique for bronchitis. Medical Properties: Expectorant, antibacterial, antifungal and antiviral. Uses: Respiratory/sinus infections and decongestant. Fragrant Influence: It promotes health, well-being, purification, and healing. Application: Directly inhale or diffuse. It is important to always use 100% therapeutic-grade essential oil. I wanted to review in the next few days some of the Color Acupressure techniques shown in Lilian Verner-Bonds book, The Complete Book of Color Healing, because it is asthma and cold season. 1. 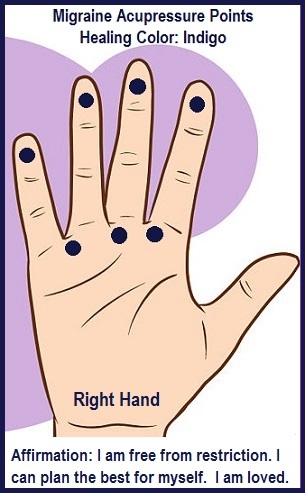 Locate the hands color pressure points as shown on the illustration. Take the left hand and start a gentle pressure on the right hand. 2. 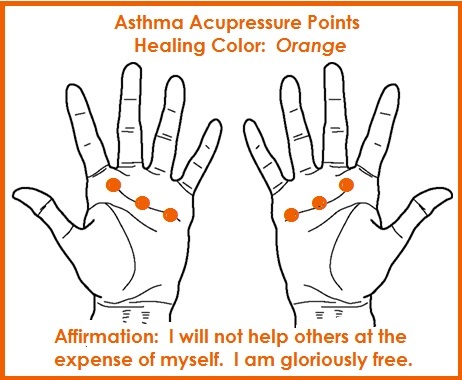 Close your eyes and visualize running the healing color orange in each of the three acupressure points on both hands. 3. Repeat the color counseling affirmation. Continue treatment for five minutes at a time. It may be that only one application is required. More serious conditions may require attention three times a day until relief is attained.